I was awfully excited to see rhubarb at our local grocery store this morning. So excited, in fact, that I immediately snatched up one of the three remaining bundles to bring home with me, despite not having a single clue what to do with it. Its something that’s surprisingly difficult to find here – last year, our farmers’ market didn’t even have it, and since the market won’t start up again until June I doubt we’ll find it this year either. 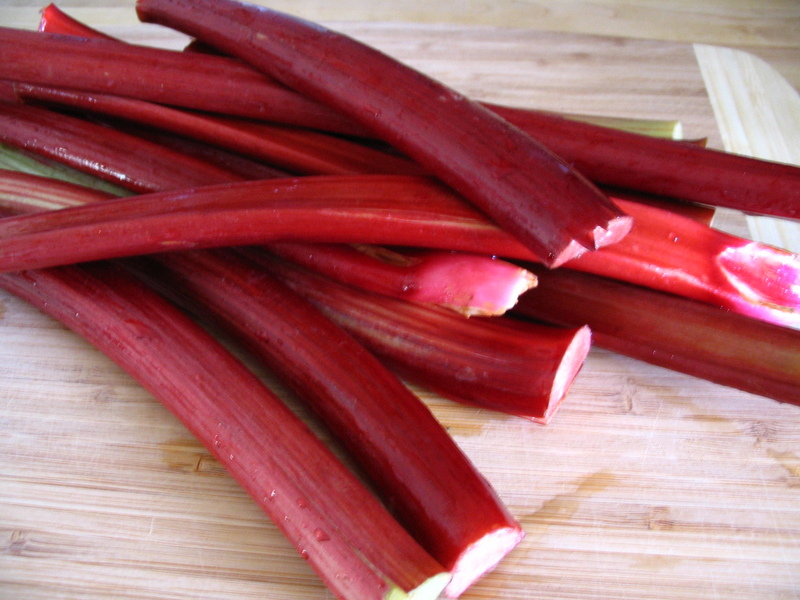 This is a shame, because I love rhubarb. Rich garnet red, streaked with almost-neon chartreuse and with pale-green-to-ice-pink insides, its a real beauty queen in the produce aisle. And its flavor – bitter and sour but with subtle floral notes – is a little abrasive, but softens and blooms with the proper application of heat and addition of sweeteners and complementary flavors. Its complex, sophisticated, and just plain lovely to look at and to cook with. 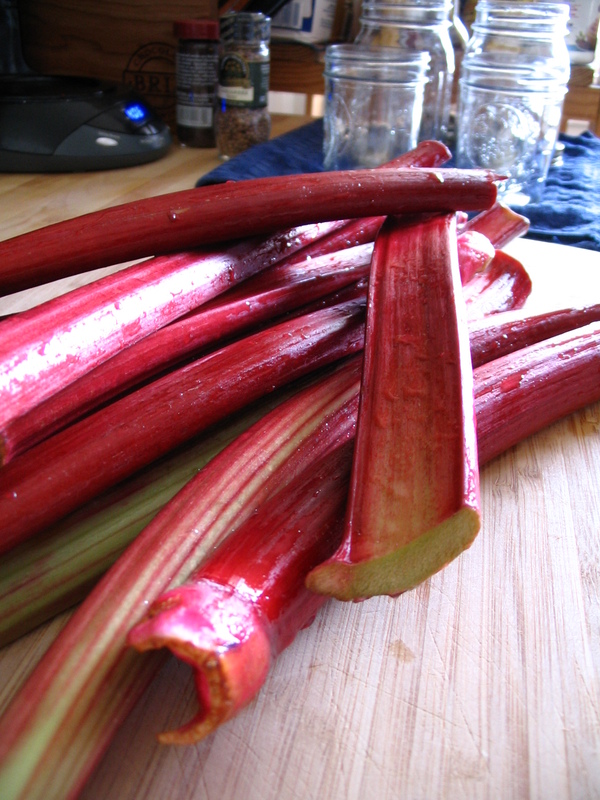 Lovely rhubarb, an edible springtime beauty. Once I got my rhubarb home, I began to weigh my options. I wasn’t in the mood to futz with pastry, so pie was out. We’d bought cereal to have for breakfast this week (a rarity around here) so I couldn’t justify making muffins or quickbread. I considered just chopping and freezing it to keep around for baking and jam-making later in the season, but our freezer is currently full to overflowing with steaks and burgers from Omaha Steaks and approximately two whole chickens broken down into breasts, thighs, legs, and carcasses for stock, plus a bunch of other odds and ends. 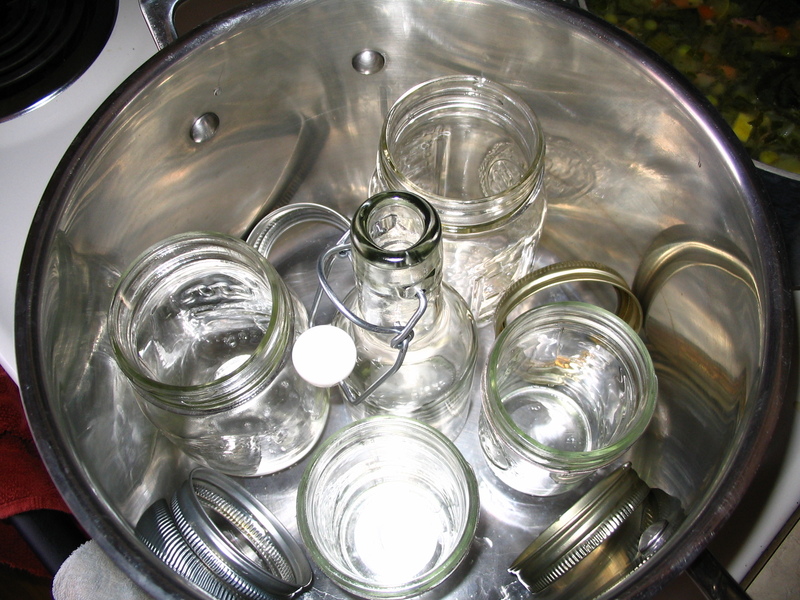 With no other viable options, it looked like canning would be the way to go. I didn’t want to just make my usual stewed rhubarb jam, though – I wanted to get as much out of this rare treasure as I could. 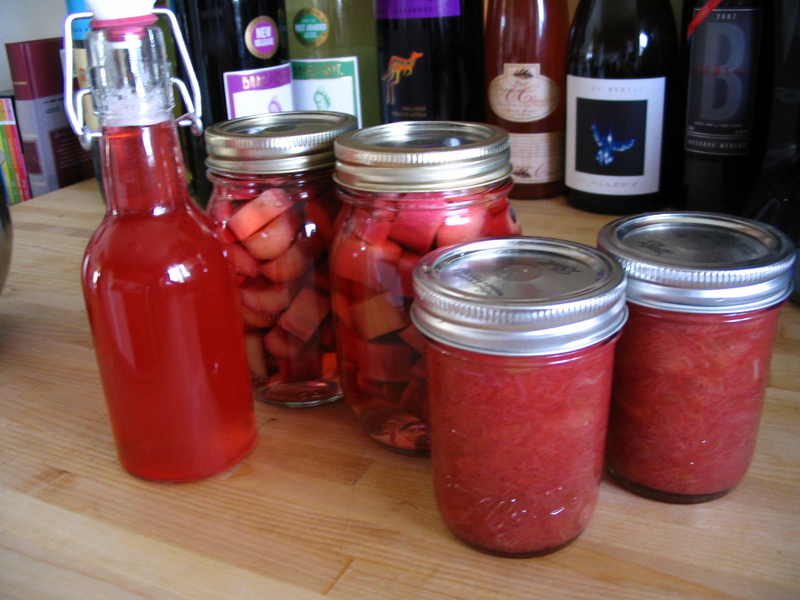 So although did make a couple jars of jam, I also made some rhubarb simple syrup, and decided to try a very simple preserve by packing chunks of rhubarb in a light, subtley sweet-and-sour syrup, in an attempt to preserve the rhubarb’s natural flavor a bit more faithfully. My stewed rhubarb jam is not something I’m terribly exacting about – I just toss whatever rhubarb I’ve got in a pan with some sugar, lemon juice, and water, boil it until the fruit breaks down, then add some powdered pectin and cook until it thickens. This time I also stirred in a couple tablespoons of St. Germaine elderflower liquor, thinking that its sweet, floral character would match well with the rhubarb’s natural tang. 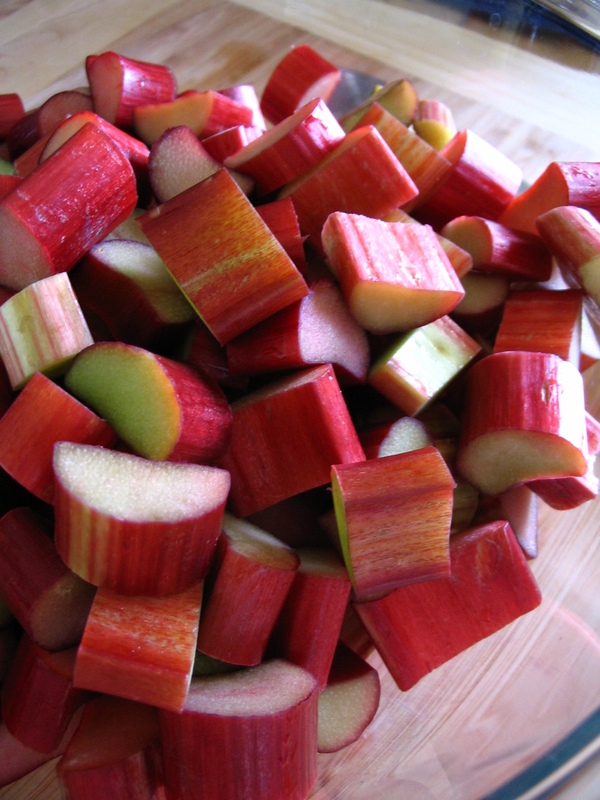 Chopped rhubarb, jewel-like and beautiful. The simple syrup is indeed simple to make – I just tossed equal parts rhubarb, water and sugar in a pan and cooked it until the rhubarb broke down, then poured the mixture through a fine mesh strainer to separate the liquid from the solids. Since I had my jam standing by, I just added the leftover pulp into the jam and eliminated any waste from the process. Just love these colors, gorgeous in the late afternoon sun. 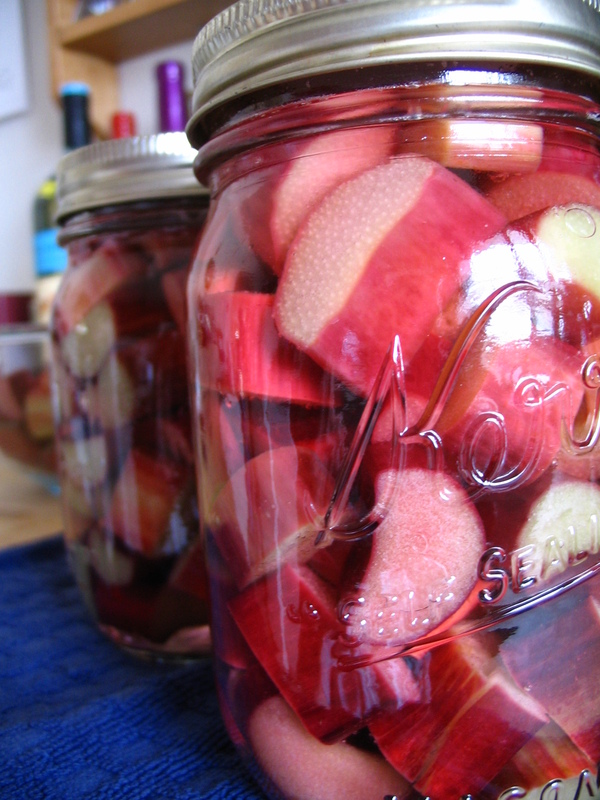 Even in a jar (or bottle), rhubarb is beautiful. I love the glowing ruby hues of these jars, and I love that I’ve now got rhubarb on the shelf just waiting for a day when creativity strikes. The results of a relatively easy afternoon's work. And perhaps more than anything, I love that I was able to kick off the canning and preserving season when I was least expecting it. Bring on the summer berries and stone fruit, the pickles and tomatoes – the weather’s getting warmer and I’m ready to get canning! 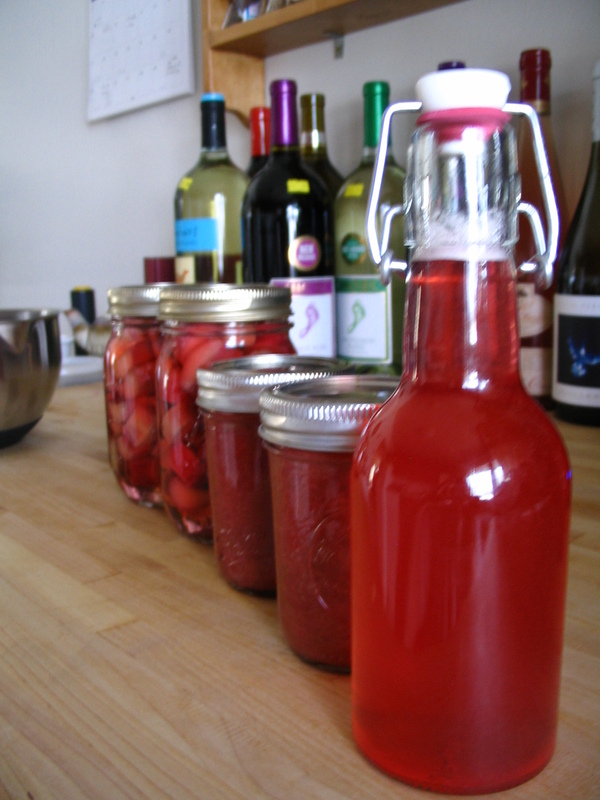 This entry was posted in Food, Drinks and Cooking and tagged canning and preserving, fruit, jam, rhubarb, syrup. Bookmark the permalink. have you used any yet? 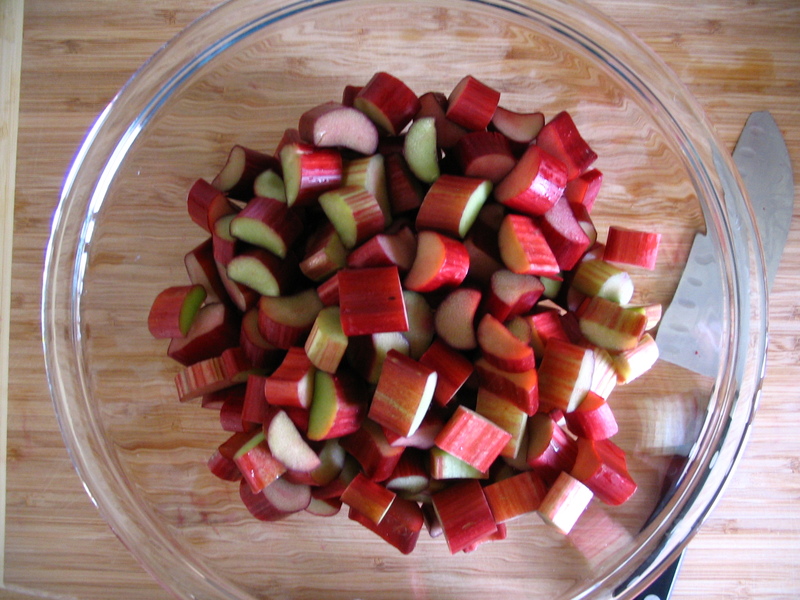 I am really curious and tired of having stewed rhubarb! how does it taste? i just made strawberry/rhubarb jam and i was happy at how great of a job it did at cutintg back the sweetness of the strawberries and sugar i can’t imagine the syrup is very sweet?